FACT CHECK: Did Ronald Reagan Predict a Trump Presidency? Did Ronald Reagan Predict a Trump Presidency? A photograph of President Reagan shaking hands with Donald Trump is real, but a quote frequently associated with it is not. 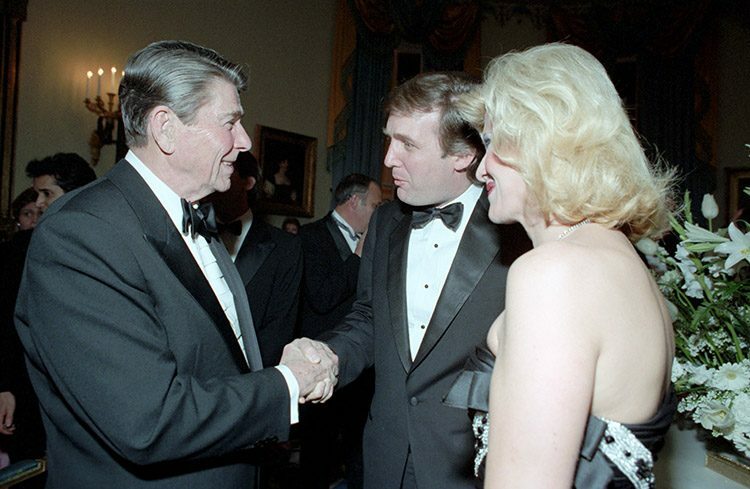 Ronald Reagan said he felt like he was shaking the President's hand when he met Donald Trump. For the life of me, and I’ll never know how to explain it, when I met that young man, I felt like I was the one shaking hands with a president. Although the photograph of Ronald Reagan shaking hands with Donald Trump is genuine, we found no record of the former President’s uttering the phrase quoted above upon meeting the New York business magnate. In fact, this quote wasn’t attached to the photograph at all until 30 July 2016, long after Reagan’s death, when it was posted to the “Trump Train” Facebook page. A previous investigation into “Trump Train” found that the social media site frequently shares hoax stories and fake quotes. “At best, he would be confused by Donald Trump and the way he’s running the campaign. I don’t think he’d be appreciative of the demeaning style of Donald Trump — the way he’s treated the other candidates — because my father knew that at the end of the day he had to bring everyone together to win an election,” Reagan said. The Hill. 10 July 2016. The Washington Post. 22 June 2016.